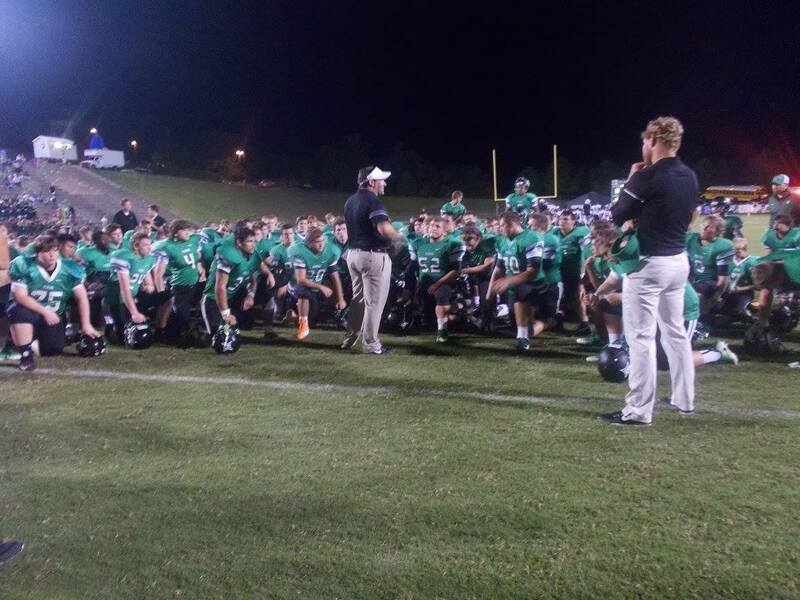 Last night, the Pickens Dragons varsity football team took to the road for the first time in the 2016 campaign as they took on a familiar opponent in the North Hall Trojans. These two teams were apart of the 7-AAA region some years ago, but haven’t faced off since 2009 with the Trojans carrying a 4 game win streak into last night’s match up. 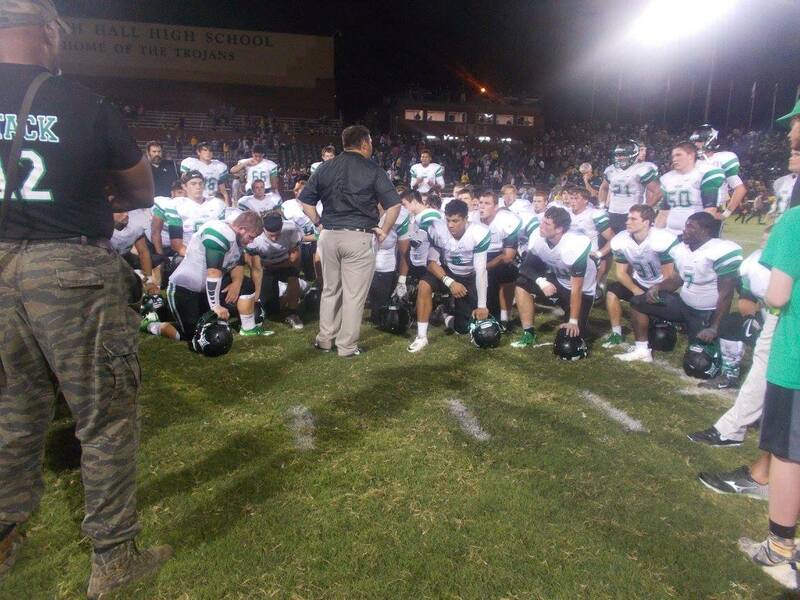 Pickens won the coin toss and elected to differ to the 2nd half giving the home standing Trojans the ball first. North Hall used their wing-t offense to drain nearly 8 minutes off the 1st quarter as they powered it in from 2-yds out, giving them a 7-0 advantage with 4:07 left in the opening frame. The first quarter came to an end as the Trojans held the lead, 7-0. Both teams went back and forth in the 2nd quarter, with neither team able to come away with points. Late in the half, North Hall marched their way down the field as the Pickens defense thought that they had forced a fumble at their 5-yd line. When it was determined that the ball went out of bounds, the Trojans were able to get points with 26 seconds left, to stretch their lead out to 13-0 at the break. The 3rd quarter, like the 2nd, saw both teams trading field position looking for points. North Hall found those points in the form of a 25-yd field goal at the 5:30 mark, to make it 16-0. Pickens finally was able to get a sustained drive going towards the end of the 3rd, and 8 seconds into the 4th, Chris Pittman fought his way into the end zone for the score. Jacob Brumby connected with Dylan Huffman on the 2-pt try and suddenly, the Dragons were in the game with 11:52 left. Both teams traded possessions during the 4th, and Pickens had their last chance at tying the ball game up with just over 2 minutes left. The Dragons mixed the run and the pass well converting on key 3rd downs during the drive. Pickens found themselves on the edge of the goal line as time was winding down. 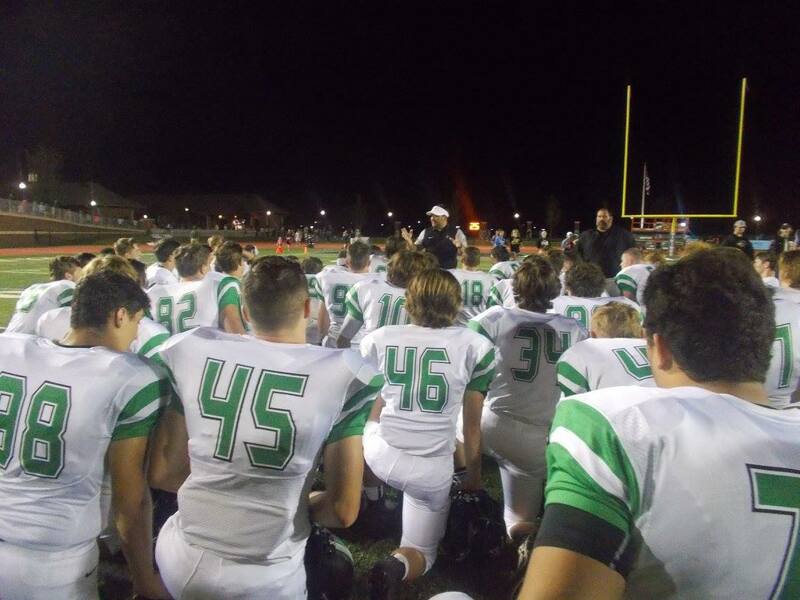 As the clock struck 0, the Dragons fell inches shy of a score that would have given them the chance to tie it. North Hall was able to come away with this one, 16-8. Avery Luke led the Dragons in tackles with 11 including 7 solo, Will Wotring & Michael Cain each had 9 tackles, Michael Burrell finished with 8, & both Alex Pittman & Josh Cain finished with 6 tackles each. Yesterday, the PHS Dragons varsity baseball team hosted former 7-AAA region foe, the North Hall Trojans for an afternoon ball game. It may have been cool, but the weather was perfect for the teams, and fans. In the 1st, North Hall looked to put up some early runs, but starting pitcher Dominic Stephens and the rest of the Dragons had other ideas and sent us to the bottom of the inning with two Trojans stranded. Pickens got a lead off single from Travis Huffman, but could not manage anything else in the bottom half as we went to the 2nd. An RBI double for North Hall in the top of the frame gave the Trojans a 1-0 lead. The Dragons got three straight hits to load the bases with two outs looking to tie or take the lead, but were picked off at 2nd to end the threat and send us to the 3rd. 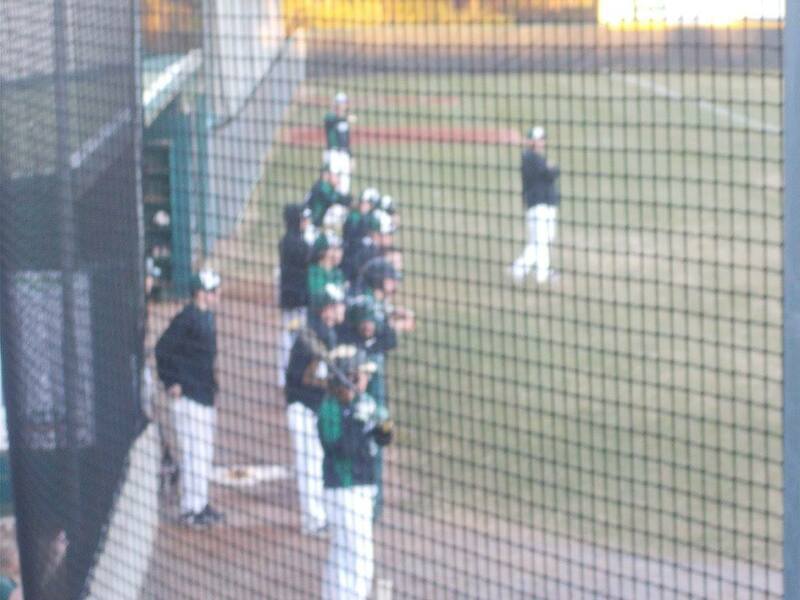 In the 3rd inning, North Hall went quietly as the Dragons turned two to keep the deficit at 1-0. In the bottom of the 3rd, Pickens could not get anything offensively as well going down in order, as we headed to the 4th. The 4th saw the Trojans plate a 2nd run to stretch their lead to 2-0. The Dragons had yet another scoring opportunity, but it was derailed by a double play that ended the inning and sent us to the 5th. The 5th inning saw North Hall get another run added to their total to make it 3-0 going to the bottom of the frame. Pickens again had a potential scoring chance denied as they hit into their 3rd double play of the game, ending the 5th, and sending us to the 6th. In the 6th, the Trojans tacked on another run to make things 4-0. The Dragons were finally able to plate a run when Walker Lawrence drove in Joseph Gossett to make it 4-1 going to the 7th. North Hall added two more runs in the top of the 7th to make it 6-1 in favor of the Trojans going to the bottom of the 7th. A Stephens homer would be all the scoring the Dragons could muster in the final inning giving the visiting Trojans the win, 6-2. Pickens now moves below .500 on the early season at 2-3. 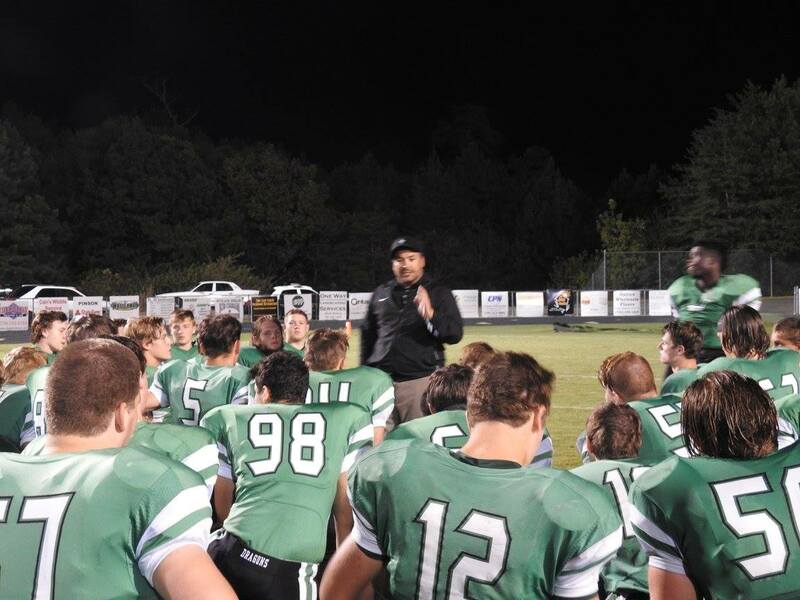 Pickens will now get ready for doubleheader Saturday as they travel to Gainesville to take on the Chestatee War Eagles & the Dawson Co. Tigers at Chestatee High School. The Dragons will take on the War Eagles first at 11 a.m. then follow that up with a scheduled 2 p.m. first pitch against the Tigers. 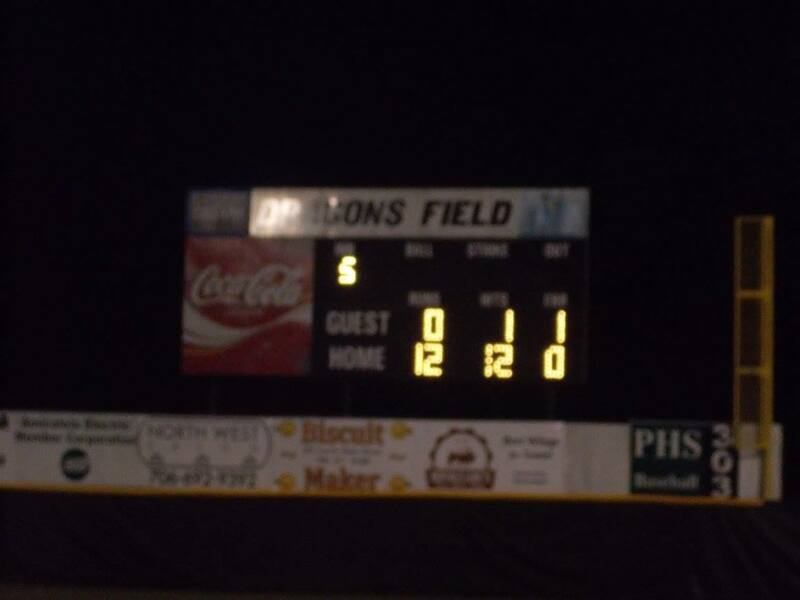 After a thrilling 9 inning game between the Dawson Tigers and the Apalachee Wildcats, the Dragons were next to play the Wildcats. Pickens wasted little time getting the scoring started. After Senior starting pitcher Tyler Garner got a 1-2-3 top of the first, the Dragons got on the board in the bottom of the frame as Senior Walker Lawrence drove in Travis Huffman on a sac fly to give Pickens a 1-0 lead going to the 2nd. Garner continued his stellar work on the mound as he fanned all three Wilcat batters he faced in the top of the 2nd. The Dragons added to their lead in the bottom half as Travis Huffman drove in Joseph Gossett & his brother Dylan Huffman, then Garner helped his own cause after driving in T. Huffman to stretch the lead to 4-0 going to the 3rd. In the 3rd, Garner again struck out the side to send us to the bottom of the 3rd. In the bottom of the 3rd, the Dragons opened things up with an 8 run inning on 7 hits, getting an RBI from Wyatt Gooch, D. & T. Huffman, Zach Moore, Garner, Lawrence, Dalton Presley, & Gossett. Dominic Stephens replaced Garner in the 4th and shut down Apalachee allowing only one hit and one walk. Pickens came away with the win after 5 innings, 12-0. Evening their season record at 2-2. The Dragons will again be on the home field this Wednesday as they host former region foe, the North Hall Trojans. First pitch is set for 5 p.m.